After a failed attempt at hobak-jeon, a.k.a. Korean squash pancakes, I needed to come up with an alternate plan for breakfast. That wasn’t going to work. While Chris is content with his two bagel a day habit, I wanted real breakfast. So that is how we ended up with Corny Croque Madames for breakfast. We actually split a Corny Croque Monsieur and a Corny Croque Madame, but the Madame with the egg on top tasted so much better than the plain version that Monsieur did not make the cut. Whisk in the flour until the mixture is smooth. Add the almond milk and bring to a simmer. Simmer for another 10 minutes or so, stirring regularly, before adding the cheeses. Stir in the cheeses until they are fully melted. Slice a piece of corn bread horizontally to form the top and bottom of the sandwich. Layer ham and cheese on the bottom of the sandwich, then top with the top piece of cornbread. After the cheese has melted, add a few spoonfuls of sauce to the top of the sandwich, then return it to the oven for several more minutes. While the sandwich is in the oven, cook your eggs, over-medium. 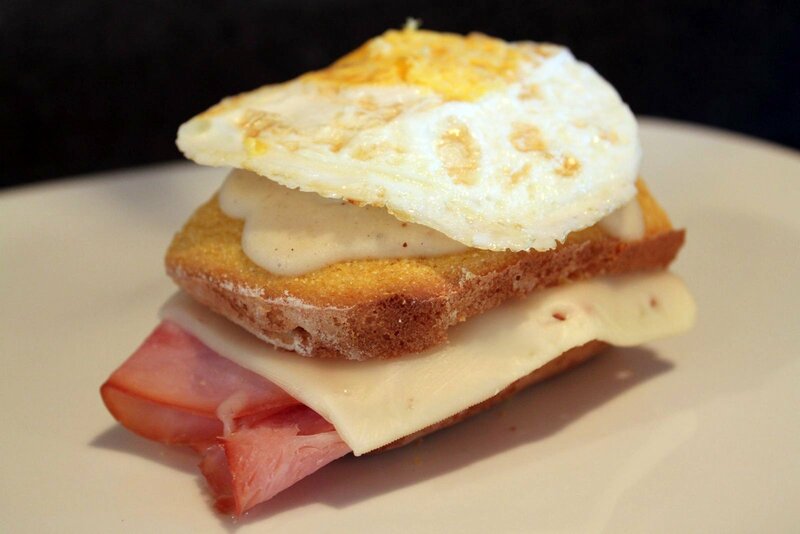 Plate the sandwich with an egg balanced on top. That looks delicious! It’s remind me of a fancy version of my standard “egg sandwich” – aka toast with a microwave scrambled egg, cheese and turkey, bacon or ham. Yum!! My breakfasts are so pitifully inferior to this, it’s not even funny!